Since the majority of motor homes, camper trailer, or RV A/C systems are used during the hottest time of the year, it is a must to keep them in good operating order. Merely cleaning and replacing the filter is not good enough to maintain your RV AC in tip-top condition. There are certain procedures for guaranteeing the maximum efficiency of your motorhome or camper trailer A/C unit. These steps are not as difficult to perform as you might think and will save you money and inconvenience as well. Cleaning the condenser and evaporator annually will make a huge difference in the cooling ability of the motorhome or camper trailer RV unit. Lubricating the A/C fan motor may help extend the life and performance of the unit itself. You will also learn a little about how these RV cooling units differ from regular household units by following the tips in this article. Be sure and check the many actual questions and answers in the comments at the bottom of this page to find a problem similar to yours if the info is not found in the main text. There are several main producers of rooftop units. Coleman RV air conditioners are common on many of the best equipped motorhomes and camper trailers. The same can be said for Carrier AC units, as well as Duo Therm A/Cs. Dometic made one of the first rooftop air conditioners, as well as camper refrigerators and ice machines. Thankfully, all of these units are similar in function and design. Some of these cooling units may even be identical under the shroud. Being familiar with household AC units will aid you greatly in servicing and repairing your air condition system, but there are a few differences as you will see. Before beginning any repair or maintenance step, it is helpful to familiarize yourself with the main components of the rooftop AC unit itself. 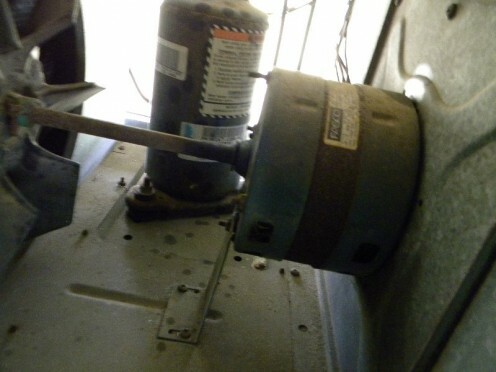 A fan motor circulates the air from the interior of the motorhome or camper trailer through the RV AC unit where it is cooled and then returned into the RV interior. 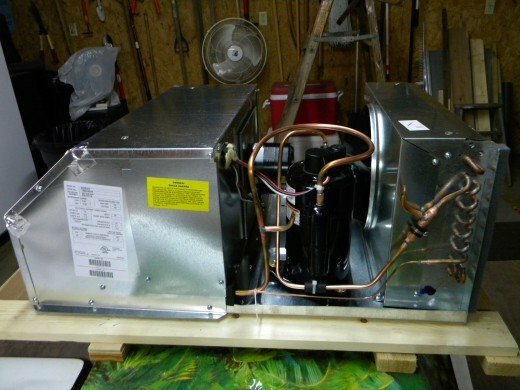 The compressor performs the job of circulating the Freon through the condenser and evaporator coils cooling fins and the cycle is repeated as the thermostat setting deems it necessary. Both the compressor and the fan motor use capacitors to provide a high voltage charge to get them moving and a lesser charge to keep them running. Often, only one capacitor is used for both fan and compressor. It the capacitor goes bad, neither the fan nor the compressor will start. This part is easily replaced and is not very expensive to purchase in most cases. 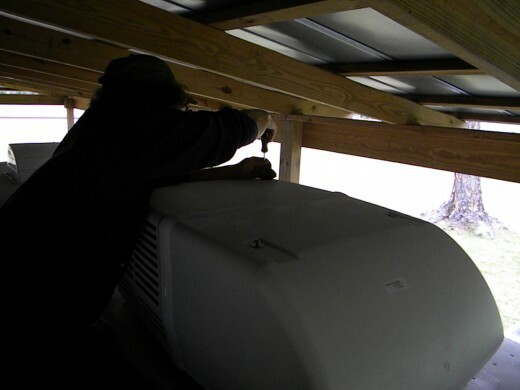 In order to clean or repair the RV AC unit, it is necessary to remove the shroud from atop the unit. Ordinarily this is a simple job requiring only a Phillips screwdriver or small wrench. Remove the four screws or nuts from the AC shroud and carefully slide it up off of the unit. If the shroud is old, it may be cracked around the retaining screws or the vent holes on the sides and back. Now is the time to repair the bad spots before replacing the shroud. A good quality epoxy cement, or other glue made for plastic repairs, should be used to reinforce the weak or broken place before replacing the shroud. It is also advisable to use wider washers on the shroud retaining screws to prevent further cracking. 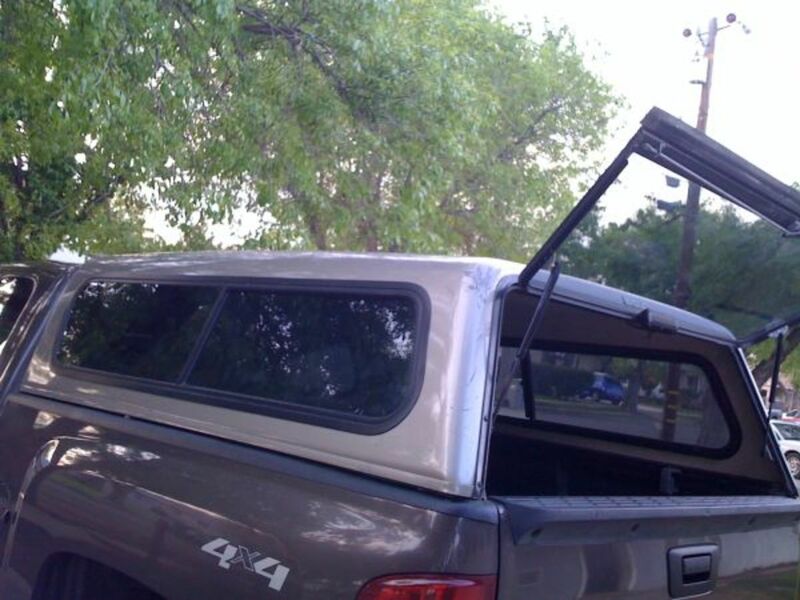 If the damage seems too bad to repair, a new RV shroud may be the only option. 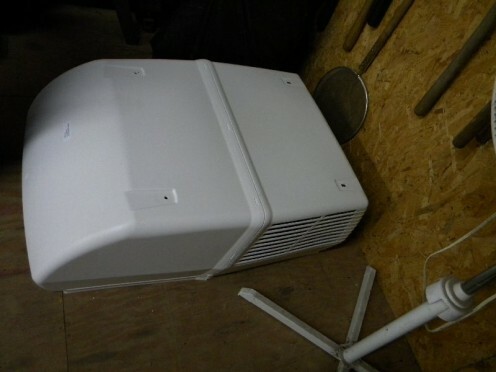 A broken RV A/C shroud will decrease cooling efficiency plus pose a danger of flying off while the camper is in transit . With the shroud removed, it is easy to inspect the fan motor for any repairs or maintenance needed. 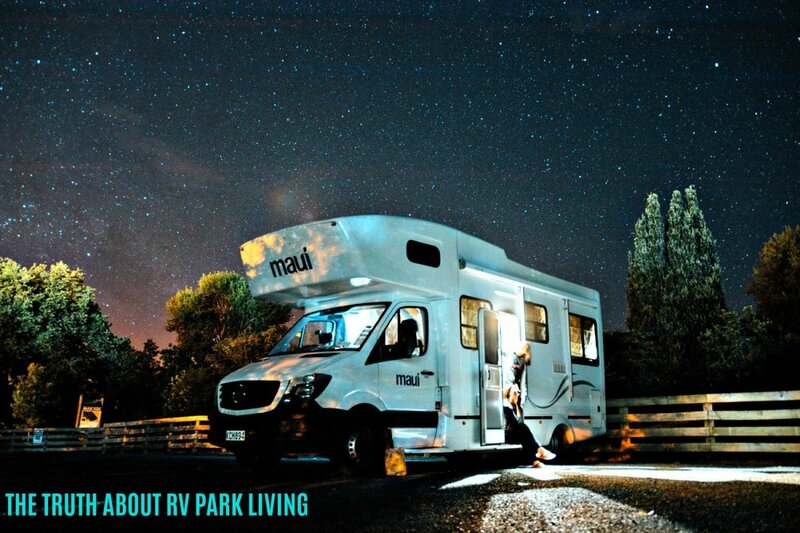 Before doing any repairs or maintenance to the rooftop RV AC be sure to turn the electrical breaker off or unplug the motorhome or camper trailer from the electrical power source. The starting capacitor may be still charged with high voltage, so be sure not to touch it with the bare hands. The fan should spin easily when turned by hand. Even so, it is a good idea to oil the bearings and clean the accumulated debris from both front and rear fan blades. It may be necessary to loosen the fan motor from its mountings to fully access both ends of the motor bearings. If the RV fan motor has oil tubes to lubricate the fan, then simply put a few drops of machine oil in the tubes on either end of the motor. If the motor has sleeves instead of ball bearings, you may still dribble a small amount of oil on the sleeves where they contact the fan motor shafts. Even a small amount of oil will do wonders for these types of fan motors. If the AC fan motor still seems to start slowly or needs a nudge to start working, it is recommended that you replace it with a new one. If the fan motor has oil tubes evident on each end of the motor, it may be rebuilt and replaced for much less than buying a new one. 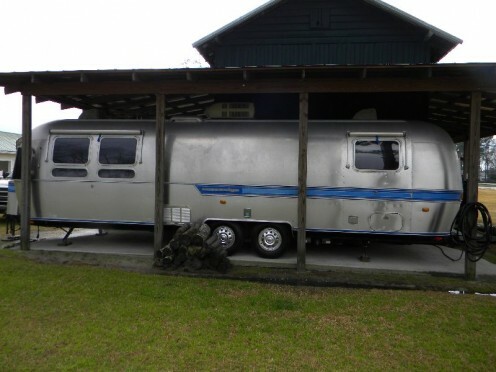 It all depends on the particular unit on your camper. If either the fan motor or compressor fails to start a new starting capacitor may solve the problem. Be sure to order the right size and voltage for your rooftop unit. These capacitors may be found at your local AC parts dealer or you may find them online for greater savings. Be careful when handling these capacitors as they may still hold some electrical charge. Spray cleaner and a shop-vac will do the job. It is recommended that you clean the condenser and evaporator fins every couple of years to maintain the efficiency of your RV air conditioner. Eventually, the cooling fins on these units will become clogged with dirt and dust. Use a good spray or foaming cleaner, such as those shown here, to loosen the debris and then use a wet/dry shop vac to remove the loosened dirt and dust. Be sure to cover the vent leading down into the interior to keep the grime from seeping down inside. Be careful not to bend these fine fins as they will bend easily. A special fin comb tool made just for straightening these fins may be purchased from an RV AC parts dealer or through links on this page. Once again, be careful when performing this maintenance procedure. Bent fins inhibit the flow of air through the unit, so be sure to keep them as straight as possible using the fin comb. You may need to use a fin straightening tool to align any bent fins in the evaporator or condenser coils. A bad capacitor is often the problem if the compressor won't start. The most costly and difficult part of an RV AC unit to replace or repair is the compressor. In many cases it is advisable to simply replace the unit instead of trying to replace the compressor. With a new unit costing about $500 to $600, spending $300 to $400 dollars for compressor replacement doesn’t make much sense. The labor involved, plus the prohibitive cost of the compressor, can almost pay for a new RV rooftop unit. These units are very easily replaced and will have a new warranty to cover future repairs for a few years. This is usually the correct option when the compressor goes bad. The alternative is to find a used compressor. Unless you are skilled in replacing the compressor and are able to recharge the unit with freon, this is not advisable. This step is entirely up to your skills and pocketbook. There are used RV A/C parts available online and locally in some cases. Be sure and check the many questions and answers in the comment section below. Feel free to ask a question if you don't see a similar question and answer, or simply ask the question if you don't have time to peruse all of the comments. If you've encountered a strange problem and/or solution, please leave a comment below so others may learn from it. Thanks for any advice you may have to offer too! Thanks for relating any odd problem with your camper A/C and or the solution. If properly maintained and serviced, your motorhome or camper trailer A/C will last for many years of camping excursions. Most maintenance can be performed by the owners if they have basic mechanical skills. Understanding how an AC unit works may just save that camping trip you have been looking forward to for so long. Be careful and take photos of the unit before removing any parts which may cause confusion during reassembly. 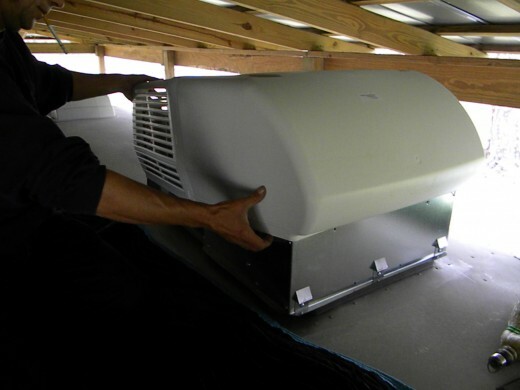 Be sure to protect the roof of your RV while servicing your rooftop unit. Good luck with your repairs and maintenance. Trent. turn your meter to ohms and check for a random number decreasing in value as long as the probes are connected to the terminals. If you get a steady number, or a 0, then the cap is bad. There is a separate cap for the compressor but I am not showing any voltage on it or the compressor.... if the cap is bad is that normal? Trent, if you only have one capacitor, then it may be too weak to start/run both the fan and compressor. Be sure there's not a cap for the compressor separate from the fan motor. I have a 2001 Jayco 5th wheel and the fan for the ac comes on but the compressor does not. I am not getting any voltage tk the compressor... the only voltage I get is to the fan cap... shouldn’t I have voltage to the compressor even if the compressor cap is bad? No James, the imbalance will ruin the fan motor. You'll have to order a new fan. Bill, hope a good coil cleaning will set you right. Randy, Thanks for confirming my suspicions and yep, flipped the power back on and the AC/heat pump fired up. Before I powered up, I observed the condenser coils/fins via ladder and binoculars and the coils seemed clean however, as we know, it's what's inside that matters so I'll pull the cover off when the winds die and do some maintenance cleaning regardless of debris presence. Thanks again. Bill, that's entirely possible, especially if the unit hasn't been cleaned recently. When the coils get clogged it allows the compressor to overheat and will shut down as you described. Try cleaning the coils with a good no-rinse coil cleaner if the unit comes back on when it cools down. Otherwise,a capacitor could be bad. Nicollette, contact me when you remove the shroud. Get someone to turn the unit on while you see if you can spot the problem. I live in south Ga. Went to use my rooftop unit in my '96 gooseneck horse trailer last weekend. It made a very loud knocking noise and would not blow cold air on low or high cool or fan. The noise was not as loud when I turned it to heat and did more of a normal humming but the longer I messed with it, a burning plastic smell began so I quit. I haven't taken the shroud off yet. Hoping this will be an easy fix. We are in GA and last weekend it was cool enough to open the windows but it will get hot hot hot soon enough. Debi, this sounds like either a thermostat or control board issue. Check or change the stat first. Irwin, this is either a thermostat, capacitor, or control board issue. Can you tell me more about the problem? Jon, it may be out of balance because of a bent blade or even a mud dauber nest attached inside the squirrel cage fan. You'd be surprised how often the latter is the case. My Coachmen Freedom Express AC fan seems to be excessively loud. Can it be quieted? Daniella, check or replace the capacitors. Around $20 for each if you have two. 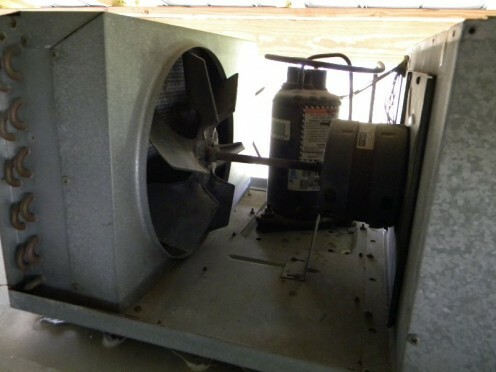 You may only have one to start the fan and compressor if it's an older model. Jeff, yes if you don't want to check it first. Just want to make sure that to discharge a capacitor you use a screw driver and ground capacitor to frame of AC before handling, is this correct? Dera, if you're sure the converter is working properly, then this may be a problem with the control board if one controls both ACs. Randy, my husband and I were camping last week at Daytona beach. Both AC units on our 2015 HR Ambassador we’re working fine until we lost power to our RV. 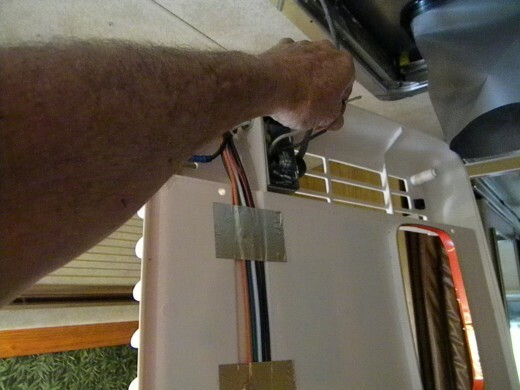 We had to have an on-site RV repair the Inverter and replace 4 batteries. When power was restored, neither AC unit would come on. The thermostat works but the units will not. Breaker is on and the RV tech tested through the fuse box inside. Is there something we are missing? Can you think of anything we can check? He did remove the thermostat, unplugged it and plugged it back in. Nothing. He strapped something on top of one of the AC units to make it work until we could get back home. Steven, yes this does indeed sound like a bad compressor cap. You can check it with a multimeter set on ohms. You should get a random number decreasing in value if the cap is good. Hope this helps! Tim, how does it act on manual? If it works okay, and doesn't freeze up with the thermostat turned up, then you may have a stat problem. Otherwise, a low Freon charge could also cause this. My camper ac will not shut off when i turn fan auto. I think the fan will cut off but the compressor will stay on and it makes my ac unit freeze up. Any idea why it will not all shut off when i put the unit on auto? That's a tough one, Bruce. If the unit still has some warranty on it, Id wait and see if it happens again. Sounds like a loose connection somewhere and may be because I've had capacitor leads be loose enough to cause this on and off type performance. My 15000 BTU heat pump roof air quit heating and cooling. Fan ran but compressor would not come on in any setting of thermostat. I took back to dealer for under 2 year warranty. It did not work at dealership and did no diagnostics other than temp check which failed. Told me to come back in week they will put new Coleman unit in. 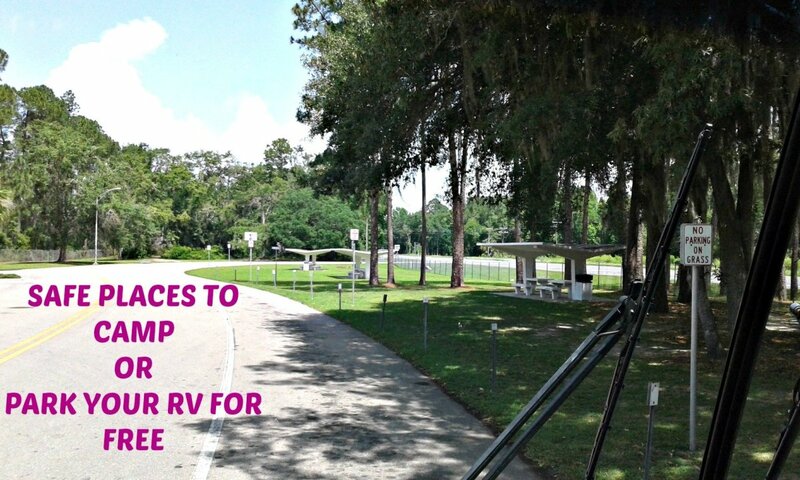 I said ok. After returning to RV park I tried it again and has worked perfectly for a week. In the meantime the dealership has called and wants to do more diagnostics on the unit because Coleman won't send out new unit without doing them. It is about a 2 hour trip one way and I'm afraid of the dealership ability to find anything wrong if it's working now. What should I do? Thanks. Odelie, if the AC is working properly, then more than likely the ductwork has collapsed and not allowing the air to travel through the vents. You might try using a long stick of some sort to spread open the ducts trough the vents. You amy have to try several until you find the one obstructing the airflow. Ac works, no air from the ducts. How do we find the problem? How do we fix it? Capt. Bob, this problem can be caused by either the thermostat of the control board in the unit. Check the stat first. Got a 15k ac on roof of 2018 Tiffin C class.After two months on rode, ac started new problem.With thermostat in auto cool the unit did not cycle to completely off as usual when target temp was achieved.Fan continued to run.Increasing target temp had no effect as well as selecting off position on thermostat.Finally stopped unit with 25A c/b.Any ideas? Pat, first check to see if there's a mud dauber nest either stuck to the bladed fan, or there may be one inside of the squirrel cage fan. If either of these fans have a nest attached it will cause the fans on the motor shaft to be unbalanced and cause this problem. If this isn't the case--it's a common problem--then check the shock absorbers. I've got a roof A/C on a 35' 2013 Forest River Salem Hemisphere. When I turn the A/C on the sound it puts out is deafening. It's a thump, thump, thump. Would it be the shock absorbers are shot? If not what would you suggest? Jordan, yes it could be a bad capacitor. You can take the cap to any electric motor or AC repair shop to have it checked or you can do it yourself with a multimeter set on ohms. If you get a random number which decreases in value the cap is good. If the number is zero or another number and stays the same, the cap is bad. Carol, this may be a thermostat issue since the light comes on while the furnace is in use. Without knowing what the light indicates, I can't advise you as what to do other than change or check the stat. Kathleen, first of all I'd have the compressor capacitor checked and/or replaced. Around $25 to replace and an easy chore. I have Coleman mach. When I have the plug in for power 110v main. Wait 20 minute for it to warm up ac inviter inside camper. Turn power to ac unit. It just makes a buzzing sound. Above fan is free. Not sure where to start at. Maybe the Capacitors gone out? Gary, you may have a problem with excess air escape, but as long as it doesn't rain on the electronics you may be okay till you get home. My cover blew off during my trip, do i need to replace it asap or can i wait a couple weeks when i am home? Lonnie, go to ACE Hardware or online to Amazon and purchase a couple cans of no-rinse foaming coil cleaner. Be sure to clean both coils well, and especially the one behind the filter. My roof air is dripping condensation on the floor ,what do i need to do to fix the problem ? Anthony, check the capacitors as they can go bad and produce such an odor. This may be all you need to do to fix the problem. Hey Randy... We have a heat pump? on top and the fan and low heat work great. When I engage the A/C we instantly get a burning smell. Id rather not replace the whole unit - any idea what I should look at? Thank you! Thank you Randy I will let you know how it works out. Do you happen to know of any RV air-conditioning repair shops in or around Prescott Arizona? Bill, of course it can be recharged if you don't have a real bad leak somewhere. Some repairmen want to sell you a new unit if they can rather than recharging the old one. The Schrader vale being installed indicates someone has already charged the unit before. Hi Randy, I have an older coach w/ 36k miles(‘93 Fleetwood Jamboree) and the AC (Coleman) isn’t blowing cold air but the compressor works and the coil fan and the blower fan work. I have been told (over the phone) that it is a sealed unit and can’t be recharged however it has a Schrader valve at the end of the tubing. Is it possible that it can be recharged? Tina, the pump may have a filter which may be clogged. Other than that, an obstruction in the main water line could be the problem. Ok I'm trying to turn my water intake from outside hose to my water tank that I have filled .And turned I turned on pump on inside panel I can hear the pump cut on but no water is coming out ?? Harold, you should get only 12 volts at the thermostat. Check the voltage first. Brandi, if the coils are clean then you may have a low Freon charge. Our Coleman Mach keeps freezing up! I run the fan and it unfreezes, but wishin about 4 hours on high cool and on, it freezes up again. Angie, you'll have to see what's listed on the compressor or on a plate nearby. Have a 2008 heartland cyclone 4012 toy hauler one of the a/c units needs Freon which type of Freon does it take? Raymond, you need to cleans both coils because when they get clogged with dust and debris the fan cannot cool the compressor properly nor disperse the excess moisture into the air. This causes the compressor to overheat and trip the breaker and also causes moisture to build up and leak down into the camper. Go online to Amazon or to a local ACE Hardware and get some no-rinse coil cleaner. 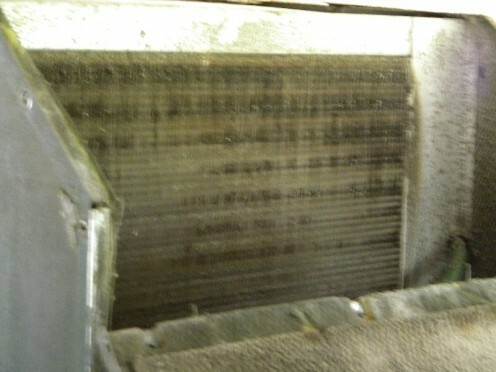 Be sure to clean both condenser and evaporator coils thoroughly. I have a 1997 jayco 5th wheel and it sits under a metal carport.when it's hot outside 90ish running the AC unit it will sometimes trip the AC breaker.reset it will work for awhile and do it again.but when it's cool at nite and have ac unit on no problems.also the AC unit continually leaks out water onto the roof.any ideas? Joe, it may be just the humidity being so high but the unit should still disperse the moisture. Yes, a humidifier may help with the situation and I'd like to know if it does. Randy, we have cleaned the unit completely and also tightened the screws on unit. Noticed that the unit does not drip at night but only when the sun is out and the temp. is in the 90's and index is over 100. Believe it is because it is just to hot. Do you think running a humidifer in unit would help? Joe, apparently your coils are extra dirty, otherwise the fan should expel the excess moisture into the air. Try cleaning them with a wet dry shop vac after they've soaked awhile. Use a good coil cleaner. Have you tried tightening the gasket between the unit and the roof? Simply remove the ceiling assembly to tighten the gasket down. I have a 2016 Sportmans travel trailer. My air conditioner unit started dripping water inside unit. I have taken off inside cover and cleaned unit and filters. Went on roof and removed shroud and cleaned unit coils, pan and down spout holes. Stopped leaking for a day but now leaking again. It is not raining. We are in the south where the temp. is 95 with a heat index of 105 , could this be the problem?? Help, and thank you. Kevin, some units have the fan running constantly while the compressor cycles on and off. Others, like your home AC, completely shut down when the desired temp is reached. Hopefully, yours is one of the former. We have a 2017 Forest River FR3. The AC unit runs all the time, even when it has gotten down to the temperature set by the thermostat. The Fan just doesn’t shut off. I hear the rooftop unit shut off but no matter how high I then turn the thermostat, the fan continues to blow. My house unit completely shuts off when it gets to temperature so I’m assuming that something’s wrong in this situation. Any thoughts? Thanks! Jason, this may be a capacitor going bad or leaking oil. I'd take a look at the capacitors and/or have them checked. Hello we have a 2018 trailmaster the main ac works great but has started to smell like rotten eggs. Not constant but can't figure out want would cause this. Any ideas? Randy, thank you so much your diagnosis it was right on . There was a mud wasp nest the size of my fist on the squirrel cage. When I left you the post we had just started a month long roadtrip and were in the desert heat. A national known rv store said it was the motor bearing and because of its age it the entire unit had to be replaced with us leaving the coach there overnight. Thanks to you and your expert diagnosis we are back on the road with an a/c that works! Thank you again! Seana, this may be a bad capacitor. Around 25 bucks and usually easy to replace. We have a 2016 Cruiser Fun Finder with dometic AC. Recently when it's close to the desired temp, the fan is very slow & low sounding..if you turn the temp down, the fan will slowly get back to how it usually operates. It doesn't always do this, very intermittently. Any insight is appreciated! Walt, check the squirrel cage fan for mud daubers as they commonly place their nests there. Have a duo therm ducted a/c on our holiday rambler atlantis. A/c blows cold but viberates very badly. I checked the fan blades and they are ok. Any suggestions? Cam, first have the compressor capacitor checked and/or replaced. A weak cap can cause this problem. Kodiak-- Try cutting off the AC breaker in the main power panel and see if this helps. I have a dutchman travel trailer and when I hook up to my honda 200 generator the a/c unit comes on even though I have my thermostat set to furnace mode. How can I get the a/c not to come on when the gen set is running? 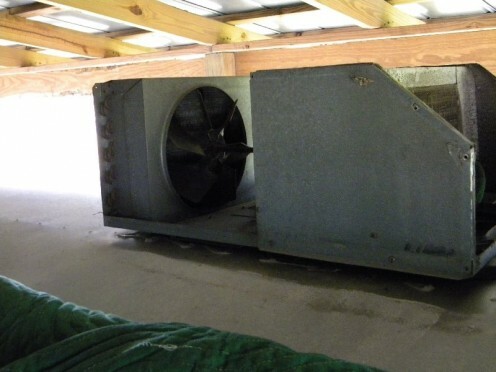 Austin, if your camper has a ducted system--either in the floor or ceiling--it's possible one or more of the ducts have collapsed and blocking the airflow. Tina, some units--especially ducted AC's--will only have the fan running before the set temp is reached. On others, the fan will run continuously even if the compressor cuts off. I just bought a 2013 Puma , and when you turn the Ac on the fan stays running the compressor cuts off , but the fan never cuts off?? Is this normal? Jim, with a digital multimeter set on ohms, if the cap is good it should show a random number decreasing in value when you contact the terminals with the probes. A steady or nonexistent number typically indicates a bad cap. Hope this info helps. I see where most of the problems encountered here are possible bad caps and your solution on a lot of them are to test the cap. What is the procedure to test a cap? Is the procedure the same for both start/run caps and compressor/fan caps? Carrie, probably a bad compressor capacitor. Around $25 and easy to replace. Shane--This may be a control board issue since the new stat didn't make a difference. I have a 2015 Dometic 15,000 Brisk Air II. I has worked perfectly in the year I've owned, up until last week. While it still cools fine, it will reach the set temperature and then turn off. 9 times out of 10 it will not turn back on unless you turn off the thermostat, wait a minute and then turn it back on. It is on a single zone LCD thermostat. No fault codes show. I bought a brand new thermostat and replaced it. Same issue. Any ideas? Mark, yes this could be a bad capacitor. AC unit was running absolutely fine. Turned it off because humidity went down and it was a nice night. When I tried to turn the AC back on, nothing. Compressor and both fans will not run. I can hear the relay click when I move the slider on the thermostat. Could this be a capacitor issue? Tracie, I do not have a wiring schematic for your camper, but you should be able to get one from Jayco online. Heat or air will not come on at all. Before the heat would come on and try to run for less then a min and shut off. Then when we had a “repair” guy look at it, nothing worked! Where do I go to find what wire goes where? Maybe the whole service book for a Jayco 28ft 5th wheel that will tell me EXACTLY where everything from air to heat, then thermostat. He changed it all around to see if he could get the heat to blow and now nothing works AT ALL!!! Cody, there should be some on this page or in the blue text of the article.